Most of them you never see, or notice. Yet everywhere you go, quiet acts of kindness surround you. Every day, good people live their lives with strength, with purpose, with compassion and integrity. Every day, the whole world is lifted by people who are happy to have the opportunity to make a difference. Usually, those who boast about it or make grand promises are not the ones who are actually advancing life’s goodness. It’s the quiet, sincere kindness, from folks who have no interest in taking credit, that gives each day its special shine. It’s hard to remember sometimes, with the relentless miserableness of the news, but the world is actually filled with good, caring people who never find themselves in the headlines and who never care to, either. The magnitude of their cumulative kindness each day is too large and far too widespread to ever be calculated. It is the perfect tonic to those who are toxic in our life – people who should know better but are nevertheless happy to offload their personal stresses onto us, to be angry, unreasonable, venial or just plain bad. Life is good today because so many people choose to see it as good. And in every small moment, each in his or her own way, they humbly give life to the goodness. Quiet acts of kindness surround you, even now. So feel the goodness and quietly pass it on. A word. A gentle gesture. A task done for someone who can’t manage it themselves. A little encouragement. Or just some simple unforced friendliness. Feelgood psycho-babble? Nope. This isn’t just “fluffy stuff”. Living in a close-knit community and having good neighbours could have hidden health benefits and may even reduce people’s risk of suffering a heart attack, new research has claimed. 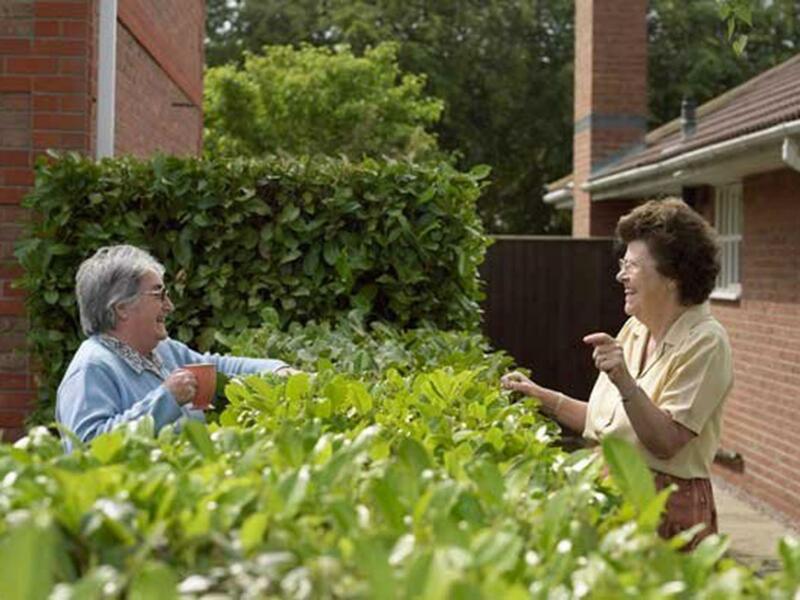 Researchers in the USA said that the social support and reduction in stress levels afforded by getting on well with the people in your community could be of benefit, particularly for elderly people more likely to suffer a health crisis. Thy found, based on a four-year study of more than 5,000 Americans over 50, that people who said they trusted and liked their neighbours, felt part of the community, and expected their neighbours would help them in a difficulty, were less likely to go on to have a heart attack. Levels of social cohesion were rated one to seven based on people’s responses. Each one point on the scale represented a 17 per cent lower risk of heart attack, the researchers from the University of Michigan said. Well, yesterday Mrs Wellthisiswhatithink and I were at the races in the afternoon. We were having a wonderful day – our mare Khutulun won with a huge surge at the end of her race and a great time was had by all. But it was somewhat spoiled by the fact that all the way to the racecourse, about an hour and a half, the car had been busily flashing warning lights at us (and plenty of things that go ping were ping-ping-pinging for all they were worth) and after Khutulun had duly saluted (at 14-1 no less, thank you very much) we called the Roadside Assist guy. He picked us up from the back of the grandstand, which was very nice of him, as by then there was the mother of all thunderstorms breaking over our head, and to find us he had to weave his way through thousands of pie-eyed drunken revellers and then take us from the track to our car which was miles away in the car park. He didn’t have to say yes to doing that, he just did. And he was chirpy, and cheery, and made us feel better because of his relentless enthusiasm. He duly got us going, chatting cheerfully all the time dispensing little jokes and bits of folk wisdom, although the car did play up all the way home and finally conked out altogether about three streets from our house, but that’s another story. What really struck me apart from Mr Happy Car Fixer was the little guy in his 60s sitting in his car waiting for the traffic to clear leaving the course, who got chatting to us as we piled out of the mechanic’s van – that’s when we eventually made it back to our car after narrowly avoiding running down half a dozen young ladies who obviously thought that drinking four bottles of cheap champagne in the hospitality tent somehow makes you invulnerable if hit by a truck. He was an immigrant from somewhere or other – I am guessing Serbia or Croatia or somewhere like that from his thick accent – and as soon as he worked out we were in a fix he said “Well, I can take you to Melbourne, no problem.” He just smiled an encouraging cracked-tooth, unshaven smile and said it, as if it was the most natural thing in the world to drive someone you’ve met 30 seconds before 125 kilometres down the freeway. We didn’t need his help in the end, but what a generous thing to say? Fair bucked us up. As we limped cautiously out of the car park a cheerfully sloshed guy making his way through the puddles back to town called out to us “Any chance of a lift?” and Mrs Wellthisiswhatithink, entirely unsure that the car would keep going for a hundred yards let alone an hour and a half answered “No, sorry.” and I felt a little guilty after the kindness that had been shown to us. But we had been told in no uncertain terms not to stop if we wanted to get home, so we spluttered and lurched onwards. Sorry mate. Hit us up again next time. Just let me get the car fixed first. Which I have no doubt will cost every penny we won on Khutulun. Funny old life. And often, a kind one.